If you choose to work with us, we will help you decide which of the options available will be right for you. That may be one option only, or a combination of several options – the best route will vary from situation to situation. 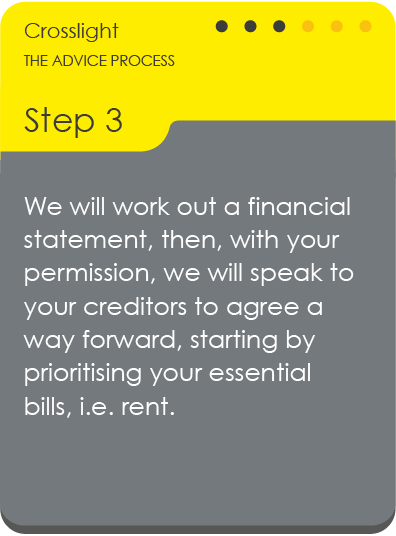 In all cases however, our first task will be to help you deal with any urgent or important debts. We call these priority debts and they will include those debts for which the consequences of non-payments are the most severe, such as rent or mortgage arrears, council tax, gas and electricity arrears or debts which involve bailiffs. Everyone’s journey out of debt is different and there are various ways of taking charge of your debts. Although the exact level of support you may need will depend on your individual situation, we’ll use the following process to advise and support you toward becoming debt free. 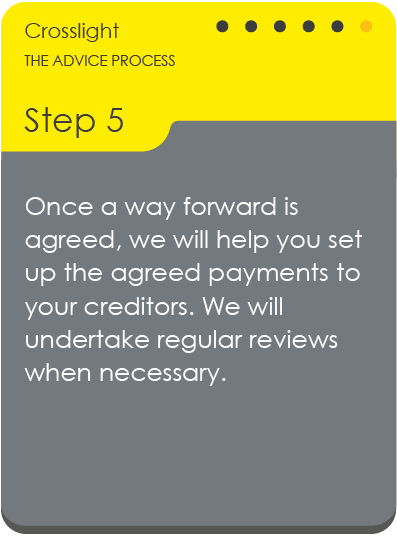 We will support you until you are debt free, however long it takes, if you work with us and stick to the plan of action we draw up with you. In most cases the options discussed in the guide will affect your credit rating and may show up on your credit record for up to 6 years. Using any of the options could affect your employment. Depending on the terms of your employment, you may need to disclose your situation to your employer. None of the options will have any effect on the rights of any secured creditors. If someone you owe money to has taken security over your home or other property they will still have the right to take possession of your home or goods if you do not repay the debt. Most credit card debts, loans and store cards are unsecured, meaning the creditor cannot automatically claim entitlement to your home or property if you fail to make payments. However if you are a home-owner, in some circumstances a creditor may be able to ask the court to secure the debt on your home through what’s known as a charging order. The people you owe money to are not obliged to accept reduced payments or to freeze interest if it is being applied. Stopping or reducing payments to them may therefore result in the debt taking longer to repay or the creditor taking legal action against you.